An Afghan policewoman and a pregnant teacher were hanged and their bodies dumped within a few kilometres of a foreign military base recently handed over to Afghan control, officials said on Thursday. The two women, policewoman and mother of two Feroza and teacher Malalai - like many in Afghanistan the pair use only one name - were kidnapped on Monday in the conservative southern province of Uruzgan, said Abdullah Hemat, a spokesman for the provincial governor. "A post mortem examination shows that both were hanged," he said. Successive, often deadly, assaults on women working in state institutions are fuelling concern that hard-won women's rights promoted by the United States and its allies are eroding ahead of the end of the NATO-led combat mission next year. Several female police officers have been killed in southern provinces in recent months. 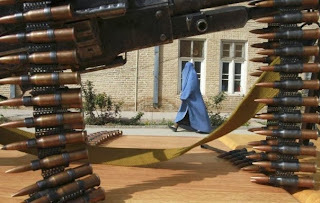 The Taliban are known to target female officials working for the U.S.-backed government, although some attacks have been linked to family feuds and male relatives outraged that the women are going out to work. The bodies were found in an area of provincial capital Tirin Kot on Wednesday, said provincial police chief Matiullah Khan. He believes both killings were linked to family feuds. Australian and U.S. forces had managed security in the province since 2005. That ended on Dec. 11 when they formally handed over control of the province to Afghan security forces. The place where the women's bodies were found is only a few kilometres from the Tirin Kot base where the hand-over ceremony occurred. Australian forces left the province on Sunday.